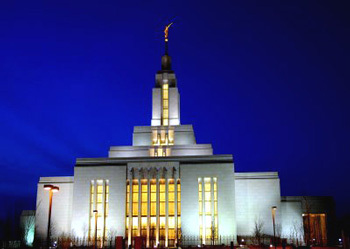 Temples are very important to members of The Church of Jesus Christ of Latter-day Saints. They are literally the House of the Lord. They are a holy place where members of the church can go to be married and sealed together as families, not just for this life, but for eternity. We feel great comfort in knowing that our family is sealed together and that we will be with our children after this life. This past month we have had the opportunity to be involved with the opening of a new Temple. The Draper Utah Temple was recently completed and is currently having a public openhouse where anyone can go inside the Temple and see it. As I have had the opportunity to take my family, friends and neighbors through the temple, as well as volunteer with the openhouse, I have again been reminded that it truly is the House of the Lord. I have felt His spirit in abundance there. I have had the opportunity to sit and ponder about my own ancestors who have passed on to the next life and to think of the great heritage they have left and my special memories of them. I am so grateful to be sealed together as a family and to know that I will see them and be able to interact with them again. I encourage anyone who has the opportunity to attend this or any other Temple openhouse -- to take your family there and feel of the sweet spirit of the Lord. It will strengthen you and give you a renewed desire to live righteously and live with a more eternal perspective.